ONLY CLICK ON THIS SHIPPING OPTION IF ORDERING ONE MISSION KIT BY ITSELF. DELIVERY TIME 1-4 BUSINESS DAYS. ONLY CLICK ON THIS SHIPPING OPTION IF ORDERING ONE MISSION KIT BY ITSELF. FREIGHT SAVER DELIVERY TIME 4-8 BUSINESS DAYS. Three clay pots. 1 inch tall. Two rows of corn stalks. 3-1/2 inches long. 2-1/2 inches tall. Includes 2 twig crosses. Cross is 1 inch tall. 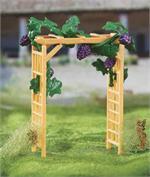 One grapevine arbor. 3 inches tall. 2 inches wide. One figure. 2 inches tall. One pond. 4 inches in diameter. One straw bale. 1-3/4 inches tall. 1-1/4 inches in diameter. 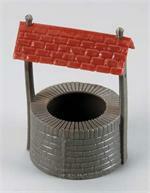 One wishing well. 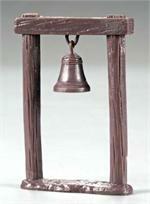 2-1/2 inches tall. 1-3/4 inches in diameter. One statue alcove. 3 inches tall. 3 inches wide. SIATG82 Aleene's Tacky Glue 4 oz. 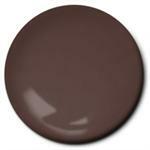 Burnt Sienna Flat 1/2oz. Bottle acrylic paint. 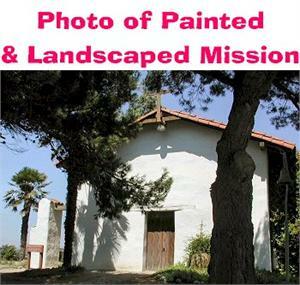 Can be used with California mission kits to paint the roof.